A great travel experience includes finding the perfect place to rest your head at the end of the day. 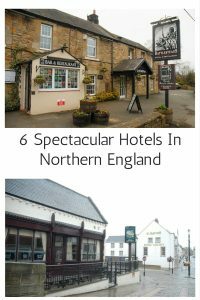 I spent a week traveling in the United Kingdom and had the great pleasure of visiting six spectacular hotels in Northern England. 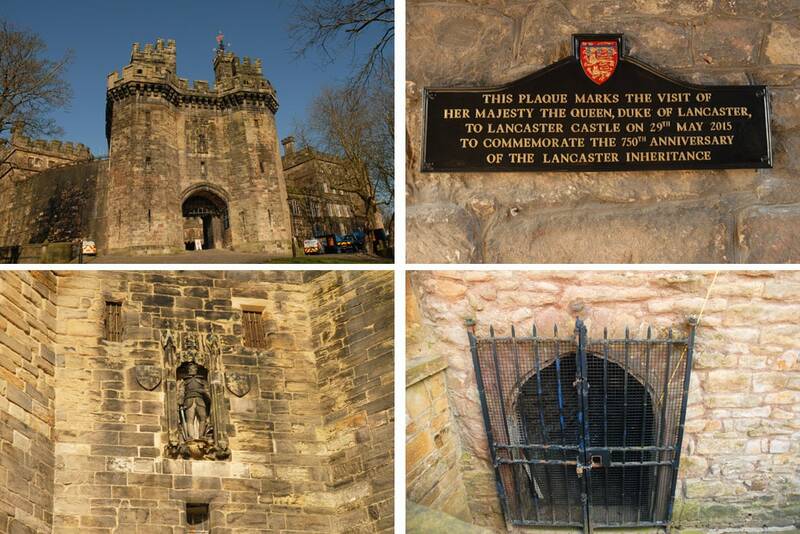 During my visit to United Kingdom, I stayed in hotels in the quaint medieval town of Durham, the picturesque village of Wark on Tyne, the city of Lancaster which is famous for it’s Pendle witch history, the village of Downham, the Pendle countryside of Barley Village, and the metropolitan borough of Greater Manchester. Northumberland is the northernmost county of England and borders Cumbria to the west, County Durham and Tyne and Wear to the south and Scotland to the north. The Durham Marriott Hotel Royal County is located in a medieval town with windy cobblestone streets and overlooks the River Wear. This isn’t your average Marriott, as the building dates back to the 17th century. There are many tales of infamous guests who have stayed at the hotel including King Charles I, who hid on the premises before his arrest for treason in 1645. I stayed in the Farnham Suite on the second floor. Rooms come with flat-screen TVs, desks, and tea and coffee making equipment. Wi-Fi is available for a fee, while upgraded rooms and suites provide it for free. Suites offer an additional living room with sofa beds and second TV. 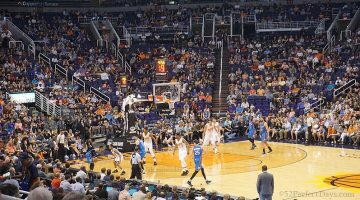 Dining options include the No. 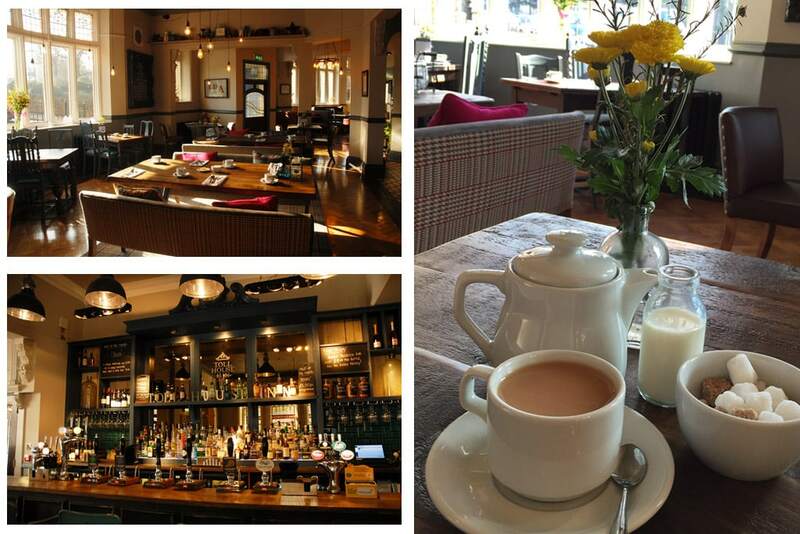 59 Old Elvet restaurant, Bar 1815 & Champagne Terrace and a Starbucks. Room service is offered 24/7. My first meal in Northern England was at No. 59 Old Elvet and my server was Olivia. I was pleasantly surprised at her understanding and knowledge of the gluten free items on the menu. They even offered gluten free bread. One of the food highlights of my entire trip was the dessert course; a wine and balsamic poached pear served with vanilla ice cream in a chocolate cup. 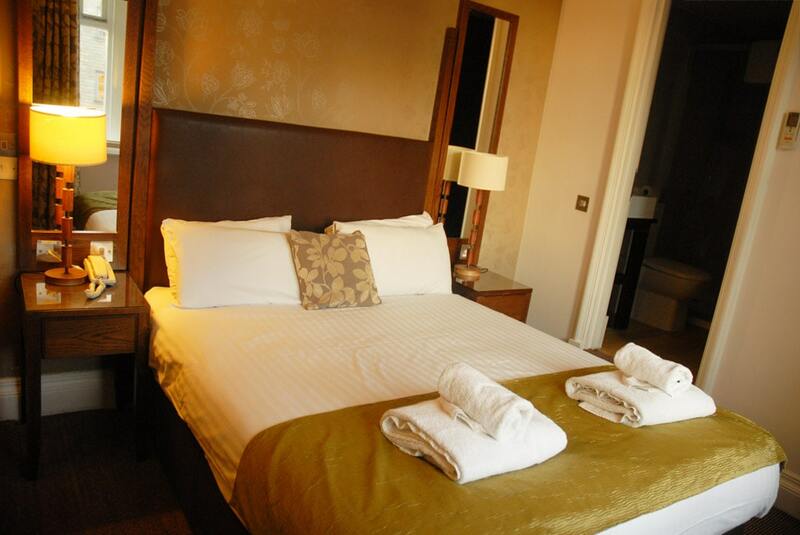 The hotel is a quick and easy to walk to town center as well as Durham Cathedral and Durham Castle. At street level, there is a restaurant, Starbucks, indoor pool, gym and spa, plus meeting space and a business center. Breakfast is served in the restaurant and includes eggs made to order and a scrumptious buffet with meats, cheese, potatoes, sausage, beans, baked goods, yogurt, granola and fruit. Be sure to ask the front desk to print you a copy of the hotel history. The hotel sits in what was once the ancient Borough of Elvet which was granted to the monks of the monastery by Bishop William of St. Calais in 1091. If you are interested in history and want a better understanding of the hotel and the town, this is a fascinating read. Battlesteads Hotel is located in the little village of Wark on Tyne in Hexham in rural Northumberland. 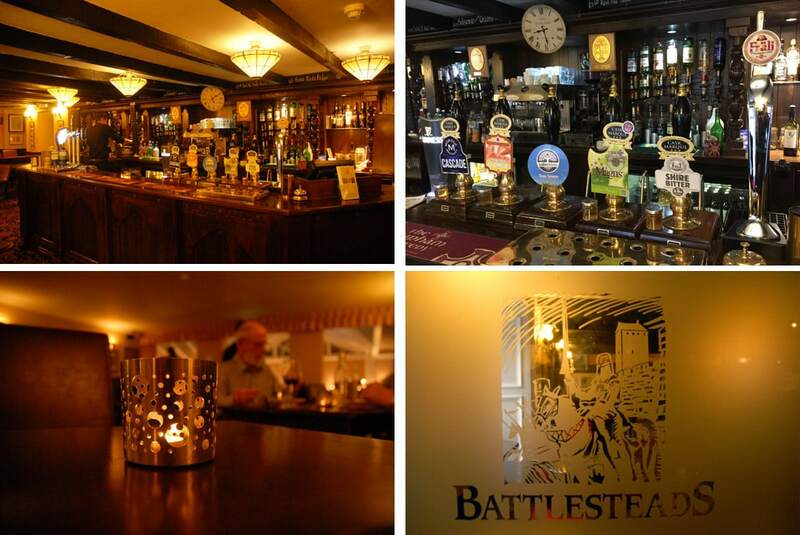 Battlesteads is a hotel, pub, restaurant and astronomical observatory. The pub is quintessential English and exactly what I was hoping for. During my stay the hotel was almost fully booked. The restaurant is also a popular dinner spot for locals. Guests arrive and are seated in the lounge next to the bar and have a chance to chat over a cocktail while waiting for the restaurant to begin seating. It was a great way to meet a few locals and start the evening. Head chef Eddie Shilton sources ingredients including oak smoked duck, chicken and salmon from a local smokery. There were also an impressive number of organic items on the menu. Once again, I found the restaurant to have a great understanding of the gluten free options just as the Marriott did, by offering gluten free dinner rolls and bread. My meal began with a cauliflower soup with truffles. 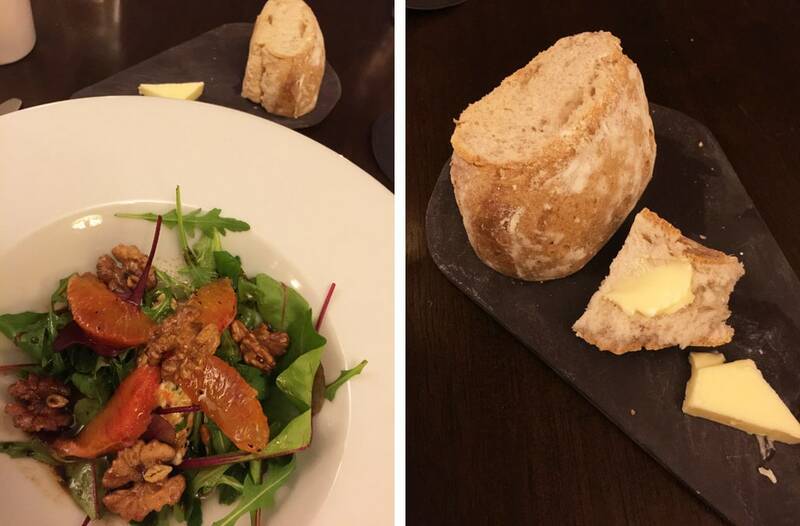 I then, happily indulged in a salad of blood orange, ricotta and candied walnuts served with a soft gluten free roll. 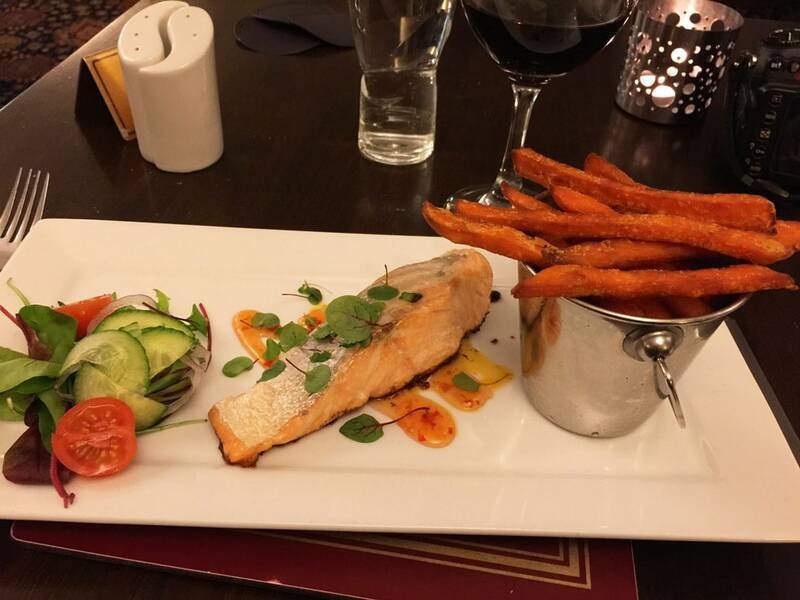 For my main course I chose local salmon with sweet potato fries. The highlight of the meal was the salad. I always know when I love a dish, because I try to reverse engineer the recipe so I can try it at home. 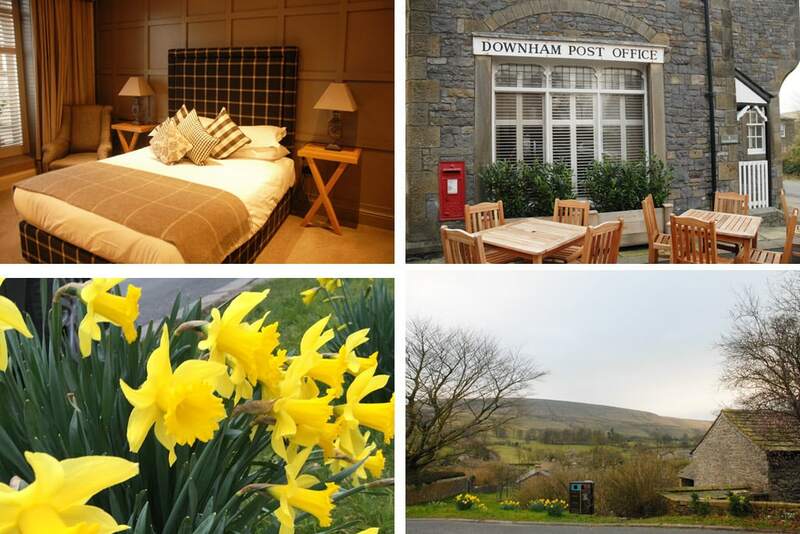 The hotel is about 20 minutes from the World Heritage site of Housesteads Roman Fort at Hadrian’s Wall. 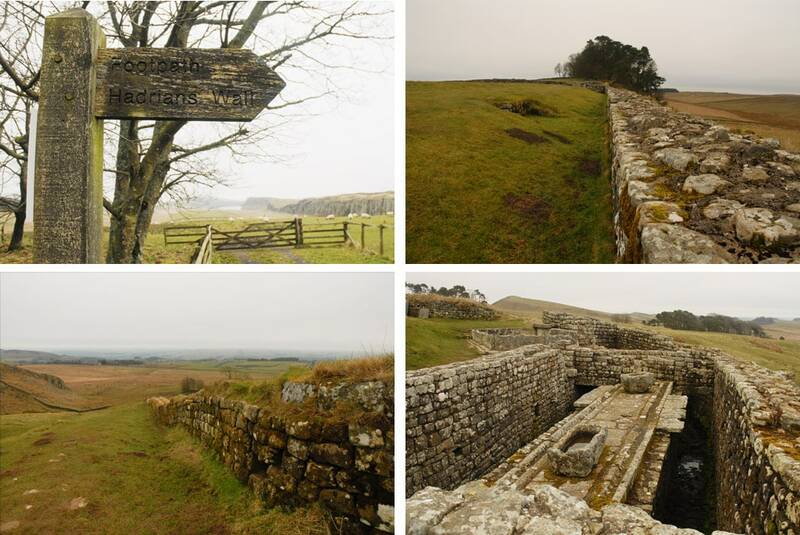 The Housesteads section of Hadrian’s Wall is the best preserved Roman fort in the country. From the ridge, you can see Northumberland National Park and the wall snaking into the distance. The hotel is located in the Northumberland International Dark Sky Park which is part of the largest area of protected night sky in Europe. One of the most unique parts of this hotel is that it is also a dark sky’s observatory. The Battlesteads Dark Sky Observatory, is a public astronomical observatory. The observatory offers a range of weekly events including aurora hunting of the Northern lights, astronomy for absolute beginners evening that includes the basics in stargazing and dark sky discovery night. Breakfast is served in the restaurant and includes the buffet as well as an extensive menu including porridge, omelettes, smoked hake and poached eggs, kippers and the Northumberland platter which includes sausage, homemade black pudding, mushrooms, grilled tomato, baked beans and butter fried bread. The menu has plenty of vegetarian and gluten free options including gluten free bread and gluten free sausages. Eggs are local and free range. The breakfast buffet has a wonderful assortment of fresh juices, dried fruits, baked goods, yogurt, granola and fruit. Did you know that the Queen of the UK is the legal owner of one-sixth of the Earth’s land surface? 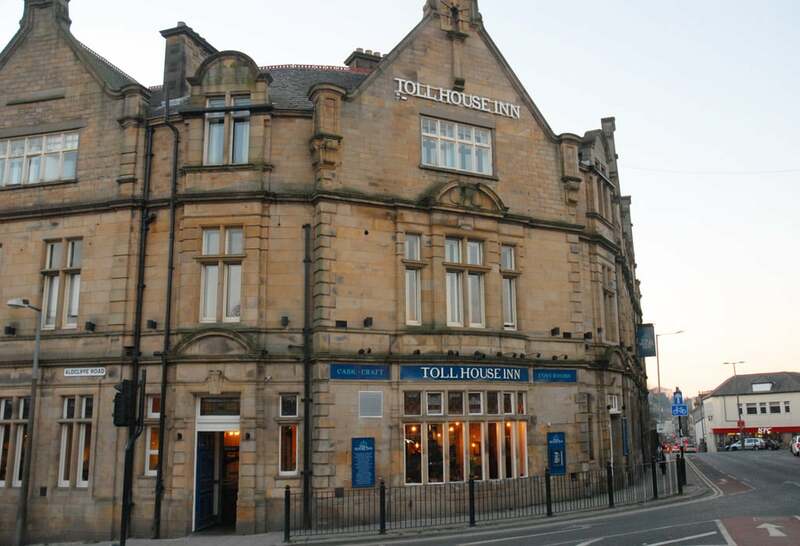 The Toll House Inn is a 28-room boutique hotel in the center of Lancaster. My room had a very comfortable queen bed and a view of the courtyard and the river. All rooms come with free breakfast and WiFi. The first floor houses the restaurant, historic bar and a flagstone courtyard. The bar at the Toll House Inn feels like the kind of spot locals hang out. The parent company, Daniel Thwaites has been brewing beer since 1807 and the bar offers four of their own cask ales on tap as well as one guest ale from another local micro-brew. The restaurant is bright with beautiful stained-glass windows, high ceilings, and wooden floors. For dinner I enjoyed the pan fried scallops and baked green lip mussels with cajun spice and pea shoots as my starter. For my main course I indulged in fillet steak with horseradish mash, buttered veg and green peppercorn sauce. I’m a sucker for a good sauce and definitely ordered this for the peppercorn sauce which was delicious. 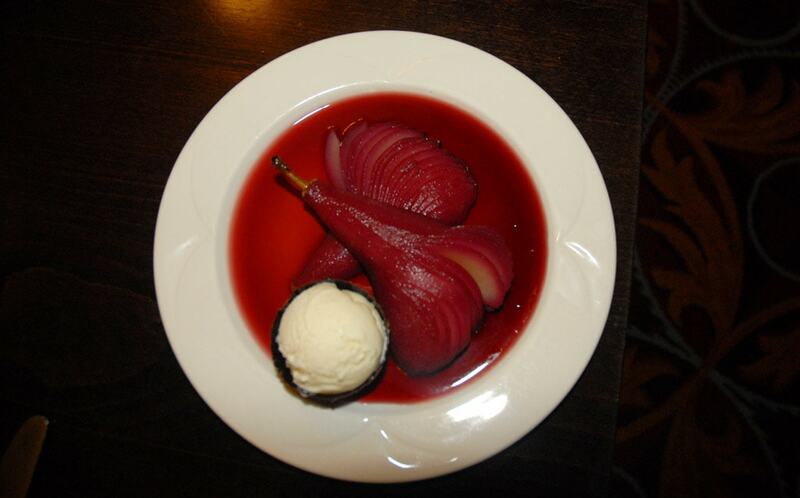 Their menu shares that they source the best seasonal produce from local and regional suppliers. A visit to Lancaster is not complete without a tour of Lancaster Castle. The castle itself dates back to the 11th century. The castle is a working court and until very recently also a prison. 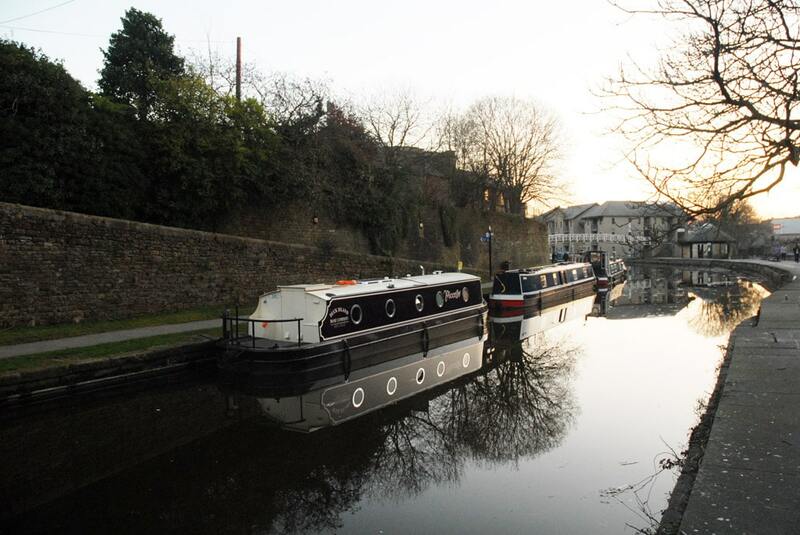 It is most famous for the Pendle witch trials, executions and also the debtor’s prison, which goes back nearly seven centuries to the reign of King Henry III. Did you know that the UK is smaller than the U.S. state of Oregon? The Assheton Arms is a traditional country inn located in Downham. 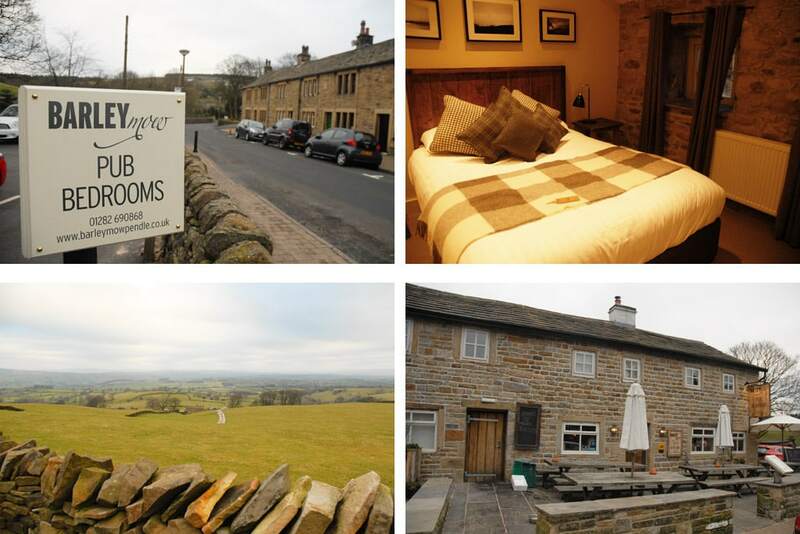 This two-story, 12 room luxury inn also houses a high end restaurant and historic grade II listed village pub. I visited for lunch and then a tour of a few of the hotel rooms. The dining room was full and it was clear that the food is the star of the show. 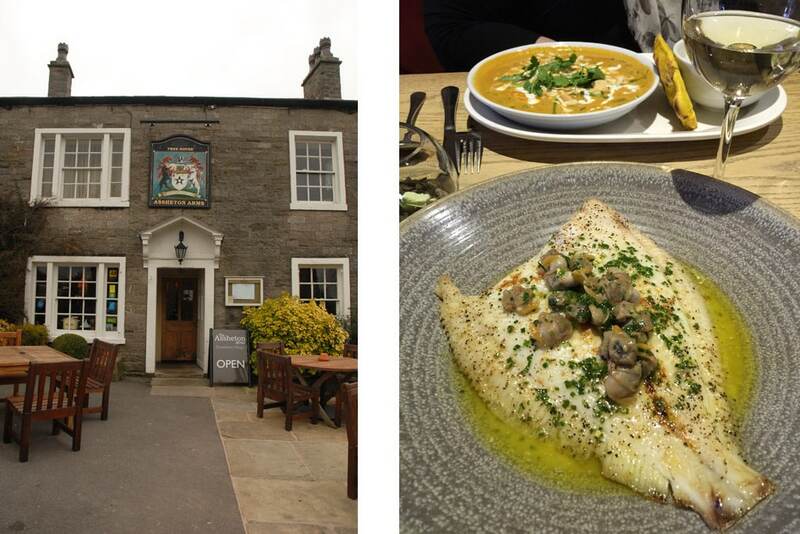 The Assheton Arms is part of the Seafood Pub Company, which owns and operates is a gastro pub group that operates four hotels and eight restaurants in the North West. 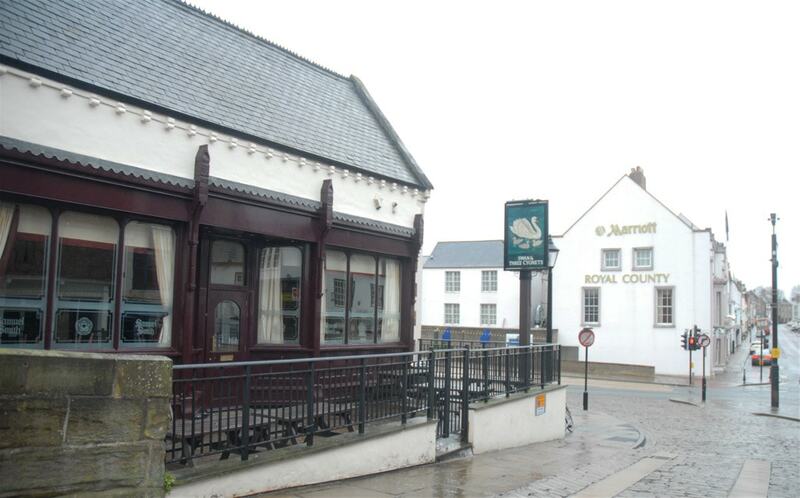 The Seafood Pub Company is a multi-award winning group of gastropubs. 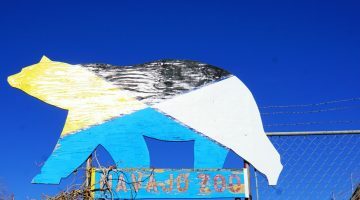 At the helm is visionary Joycelyn Neve who conceived the idea of the business. Her father Chris Neve, has an impressive fishing background which allows him to source the finest quality ingredients from sea and shore. Also on board is Executive Chef Antony Shirley who has helped put these pubs on the Northern England culinary map. While the food was stellar and the inn adorable, another reason you must visit Dowham is to learn about their history and story first hand. The entire village of Downham is owned by Lady and Lord Clitheroe. There are 1700 people who live in Downham and there is a long waiting list to live in the village. Everyone who lives here must be vetted and it is said they only pay a small rent once a year. No wonder the there is a waiting list! Barley Mow is another Seafood Pub Company hotel, pub and restaurant. 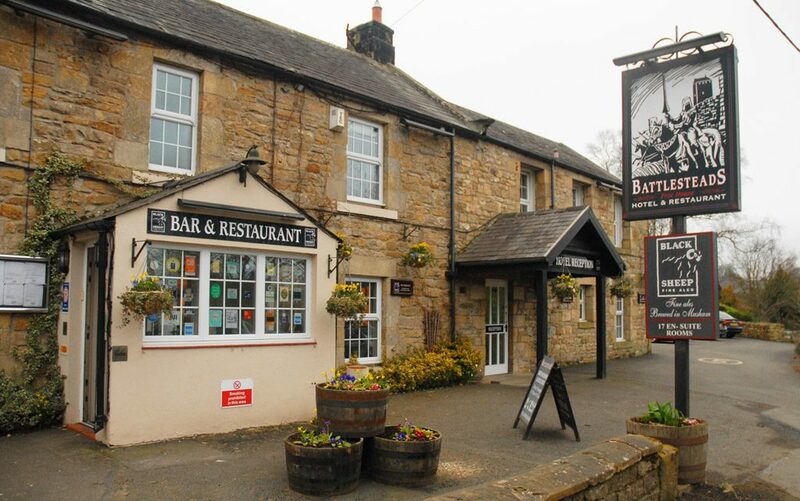 Situated at the foot of Pendle Hill, the Barley Mow is everything you could want in a countryside inn and pub. 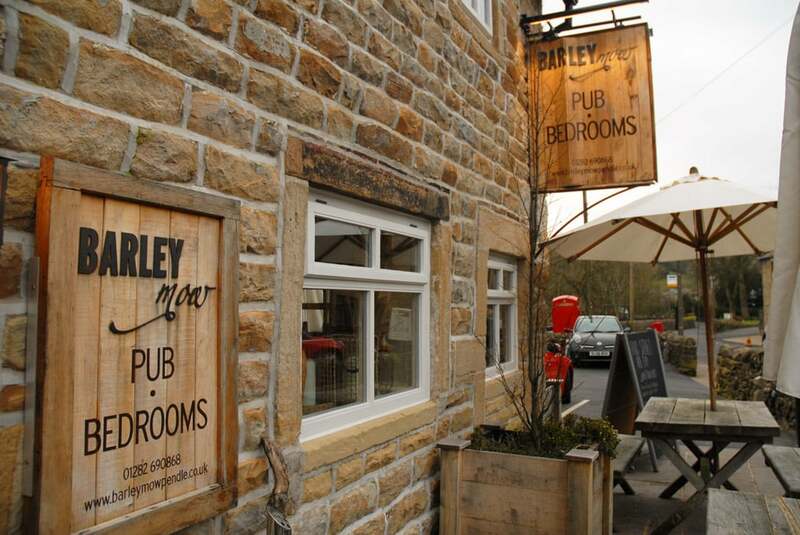 The Barley Mow has six bedrooms with flat screen TVs and free Wi-Fi. The hotel has a lodge style interior, and a definite neighborhood pub feel. The first floor houses the pub and restaurant. The restaurant is a combination of small rooms and cozy corners with fireplaces throughout. Like the Assheton Arms, the food is phenomenal. What is unique is that each restaurant within the Seafood Pub Company has a distinctly different menu. 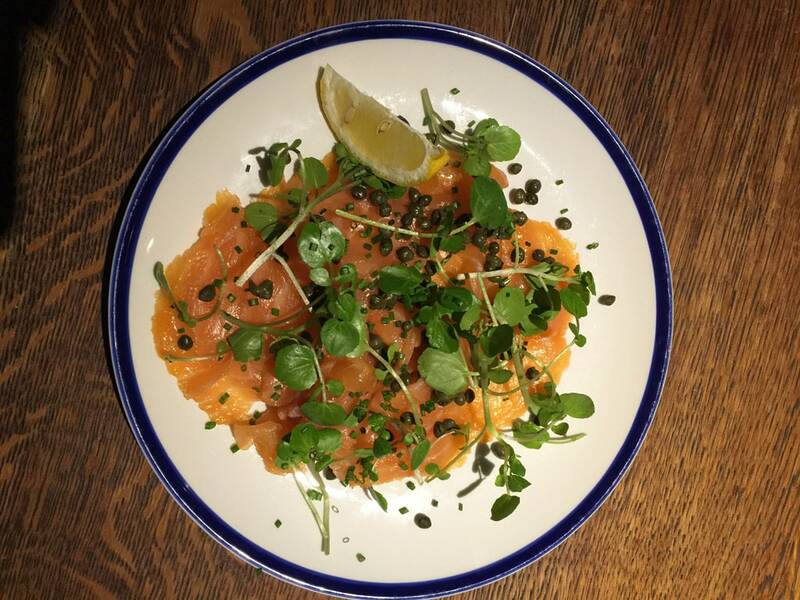 The Barley Mow is upscale pub food and one of the highlights was Chris Neve’s smoked salmon with capers and lemon. I also sampled prawn and chorizo skewers with paprika potatoes, guacamole and charred corn as well as Cuban marinated pork with lime rice and a green curry with prawns, haddock and salmon served over coconut rice. I arrived at the Barley Mow in the early evening and had to depart early the next morning. I truly wish I had more time in this quaint village to walk a bit of Pendle Hill and spend more time on the Pendle witch trail. 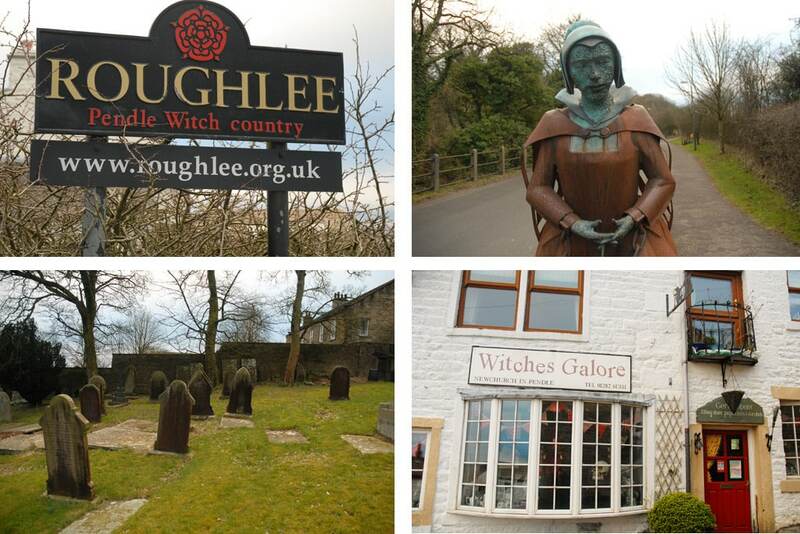 While I was able to have a quick visit to nearby Roughlee and the cemetery where many of the witches are said to be buried and see the statue of Alice Nutter, one of the witches tried. Unfortunately when we stopped by the Witches Galore shop it was closed for the evening. I’m so curious about what is in the store! I must head back to explore and buy a few Pendle Hill witch souvenirs. 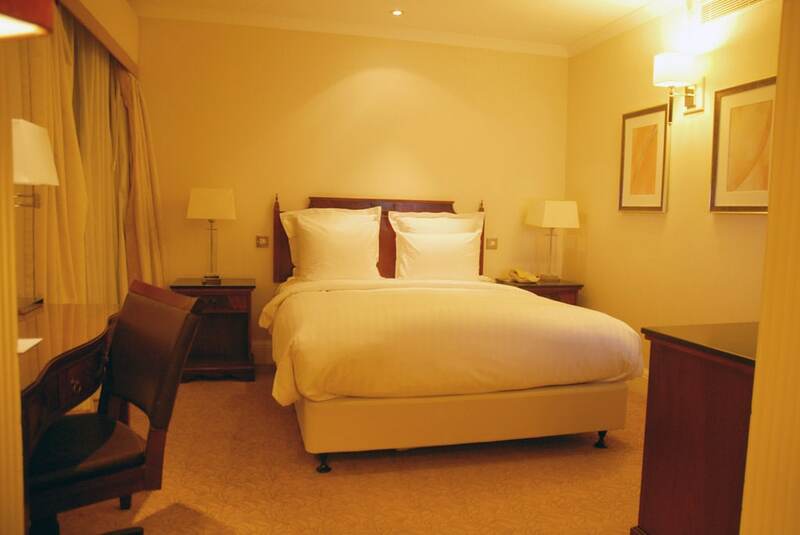 The Macdonald Manchester Hotel & Spa is Manchester’s largest four-star hotel. This was the only accommodation I stayed at during my trip that was a large hotel, which makes a lot of sense since Manchester was by far the biggest city I visited. 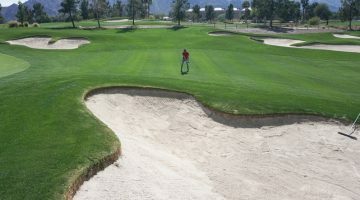 The hotel offers 338 smoke-free guestrooms, a full-service spa, restaurant, bar, lounge and health club. There is free WiFi in rooms and all rooms come with a Bose iPod docking station. 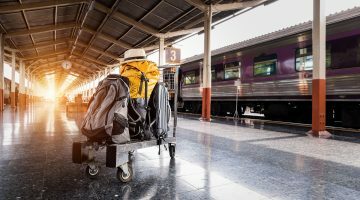 The hotel is just steps away from Manchester Piccadilly train station. 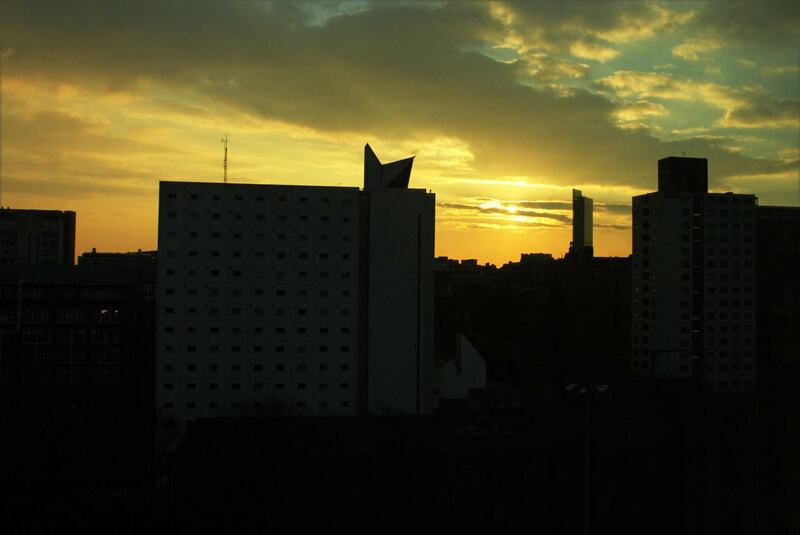 It is also a short taxi ride or walk to Manchester’s city center and Albert Square. The rooms are quite spacious and offer large windows providing a city view. Manchester is an industrial city and the views from my window overlooked many buildings. That being said, I did catch an amazing sunset during my stay. 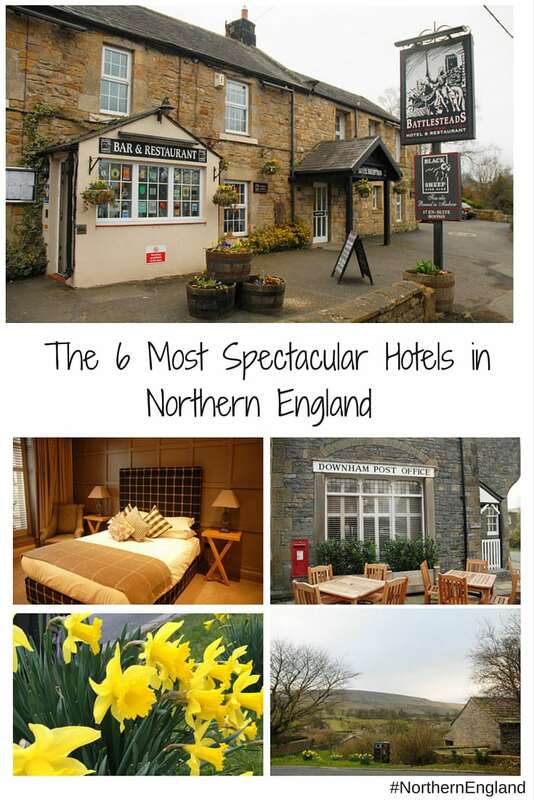 If you’re planning a visit to Northern England, you won’t go wrong by staying at one or all of these Hotels in Northern England. 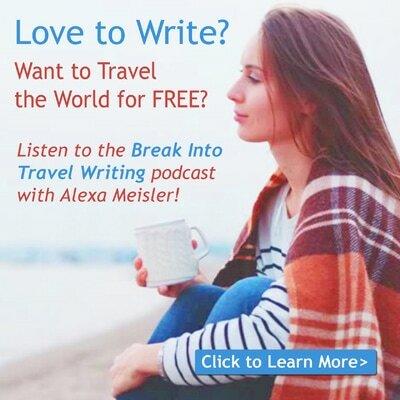 Heading to Northern England? Here are the Top 11 Things to do in Northern England. A huge thank you to all of Hotels in Northern England I visited during my trip to the United Kingdom. 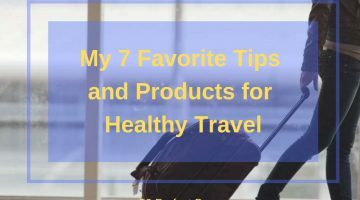 I was a guest at these hotels, but as always, all opinions are my own. They were each so unique, that I enjoyed them all, but I have to say I really wish I had a second night at the Barley Mow! I’m dying to see the Witches Galore shop! There really is nothing like an English pub/hotel! 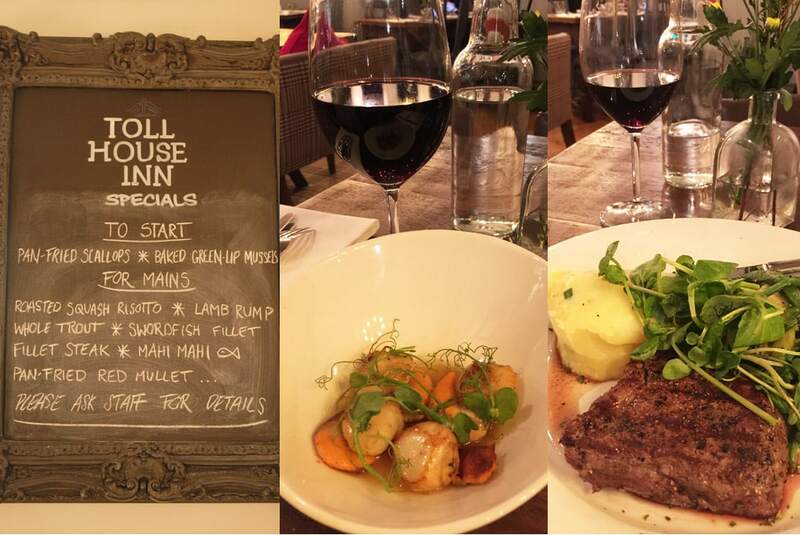 I loved reading this, particularly the Battlesteads Hotel – it looks like it is quite traditional but with modern food and in an incredible location! Very modern food. In fact they had fajitas on the menu the night I stayed. The food was amazing. It’s also such a treat to have the observatory right behind the hotel. Alexa these look amazing! This reminds me that despite what people always say, England has a fantastic food scene. I can’t wait to go back in August. It has almost been a year since I moved back to Germany and left my expat life in the UK. Thanks for sharing this! Maria, this trip broke all the English food stereotypes. I had so many wonderful meals during my visit and not one with mushy peas! Very cool. This is a great post and the descriptions are perfectly suited so a person could select one that fits just right. Thanks for the information. 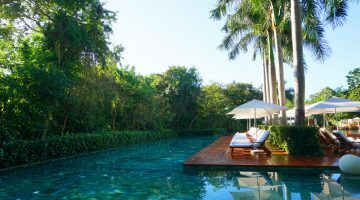 Great places to stay!!! I love the country pub style, so quintessentially English, and how cool is it that Charles I stayed in what is now a Marriott! The food definitely negates that old idea that English food is horrid, this all looked divine! 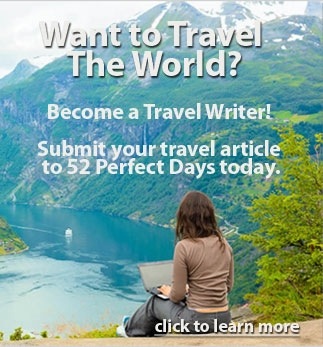 They are really awesome tour operator. I recommend you guys to also make a visit one day. I will visit again some years later from today. I think if I had to choose just one I would go to the Battlesteads Hotel! Anything near the Hadrian’s wall is definitely on my bucket list and that bar looks off the hook! Hi Eric, it’s a great location for Hadrian’s Wall. The food was amazing as well. It’s a great place with fun pub and restaurant. Great bathtub too! Those are definitely some good ideas for my future trips to Northern England. Thank you! I would love to stay at all these places, they just seem so English to an American like me. My top choice would Battlesteads Hotel – the fact that it is an astronomical observatory sounds really cool and I would hope to catch the Northern Lights! Out of these 6, I would choose Battlesteads Hotel & Restaurant. Looks really cosy and has lots to offer to someone looking for comfort away from home.